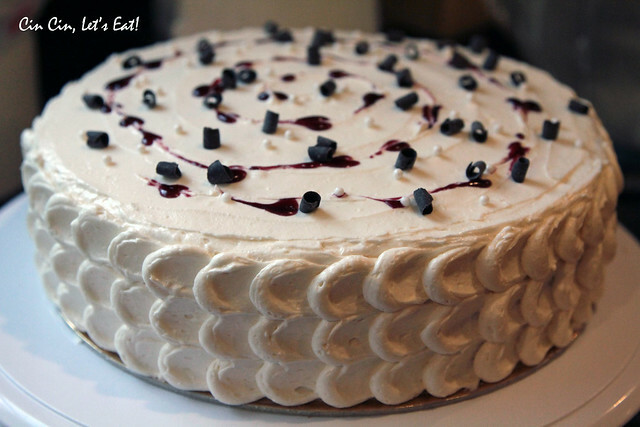 Buttermilk Cake with Blackberries and White Chocolate Buttercream [recipe] – Cin Cin, Let's Eat! Wow, can’t believe it’s almost the end of March! With the passing of the first official day of Spring last week, it’s time to get our planter box ready for summer produce. In the mean time, I’m excited to see all the bulbs I planted from last Fall blooming. 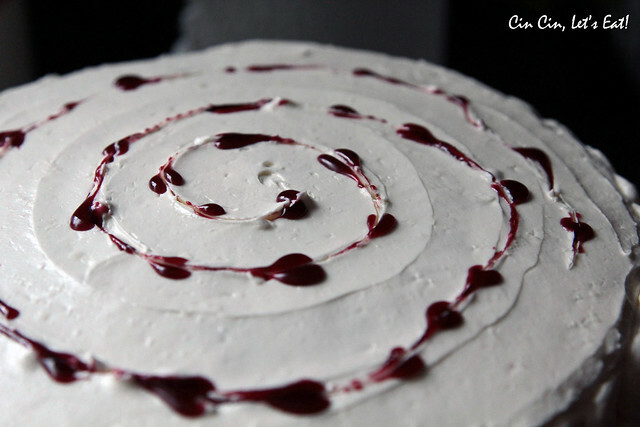 In my absence, Cin Cin, Let’s Eat celebrated it’s third birthday 🙂 As a tradition, I’m posting a cake recipe. This was actually a cake I made for my dearest grandpa, who turned 90 last month! 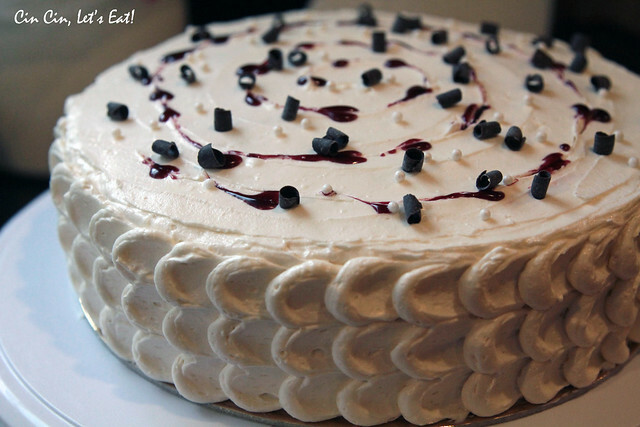 The recipe was inspired by Maria del Mar Sacasa, what a stunning and gorgeous cake! 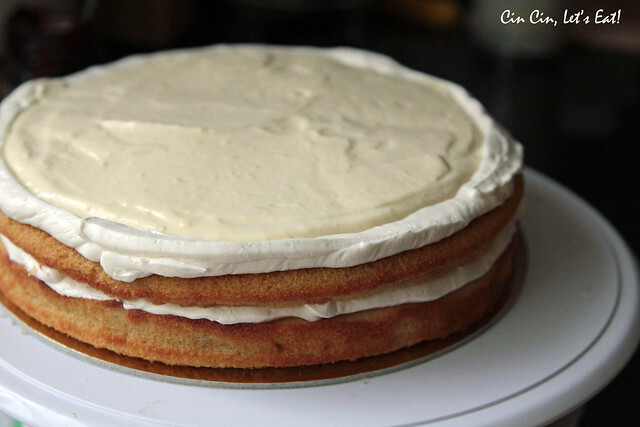 I used my go to buttermilk cake recipe along with my favorite recipes for pastry cream and white chocolate buttercream, was hoping to cut both cakes in half to get four layers but clumsy me botched one side of the cake, so I ended up with 3 layers! Grease two 9″ round cake pans, and line them with parchment paper. Sift flour, baking soda, baking powder and salt together in a medium-sized bowl and set aside. Measure out the buttermilk and add the vanilla to it, then set that aside, too. Beat the butter and sugar together until light and creamy. Next, add the eggs one at a time, beating well between each. Add a little of the flour mixture and combine well, then do the same with a little of the vanilla-buttermilk. Keep alternating as you add more, blending well each time. Pour the finished batter into two cake pans and bake for 22-25 minutes. The layers are done when the cake begins to pull away from the sides and a toothpick inserted into the center comes out clean. 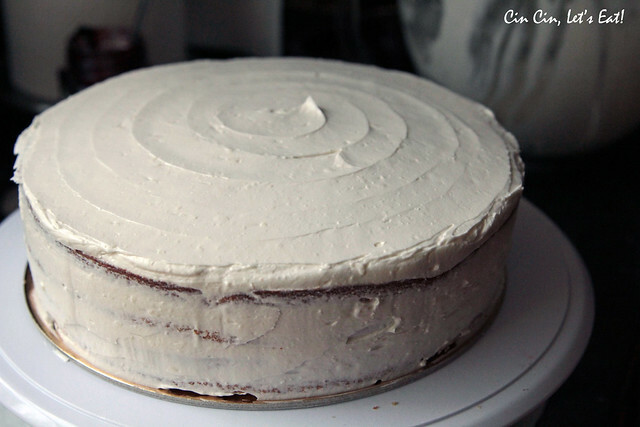 Cool for 15 minutes before removing the cake from the pans, and let cool completely before frosting. from Food & Wine, also as seen here. In a large bowl, using a handheld electric mixer, beat the butter at medium speed until creamy. Beat in the melted white chocolate. Add the confectioners’ sugar and vanilla and beat at low speed, scraping the sides and bottom of the bowl, until light and fluffy. Should yield ~2.5 cups. 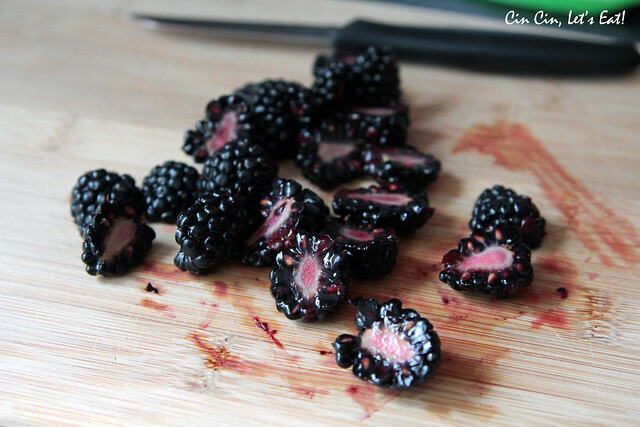 optional garnishes like chocolate curls, sugar pearls, fresh blackberries…etc. Arrange first layer of cake on a serving plate or cake stand. 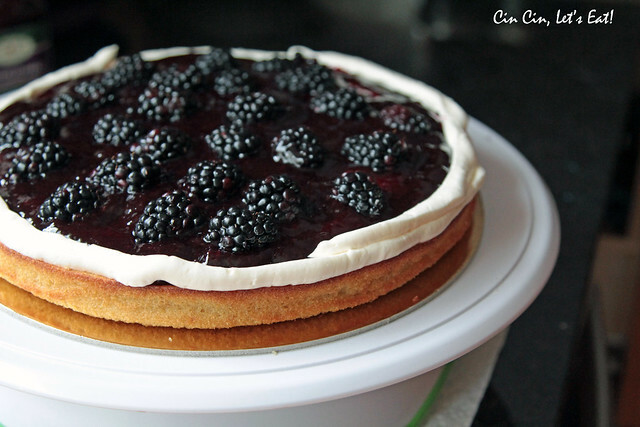 Spread the blackberry preserve on cake, topped with fresh blackberry halves. Add second layer of cake on top of the first layer. 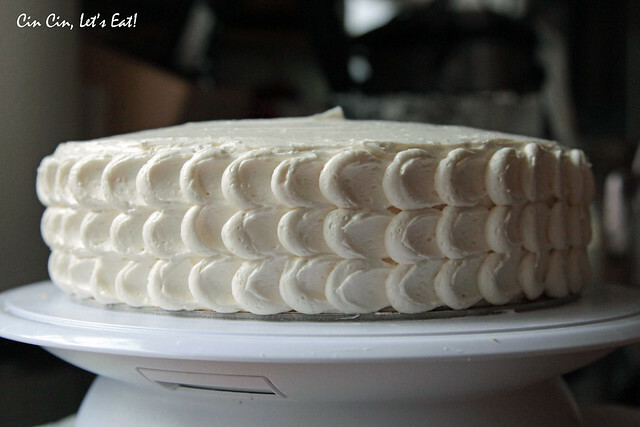 We’re filling this layer with pastry cream and to prevent the soft pastry cream from spreading, fill a small piping bag with 1/4 cup of buttercream, pipe a circle/border on the layer. Add in the pastry cream , spread until smooth. 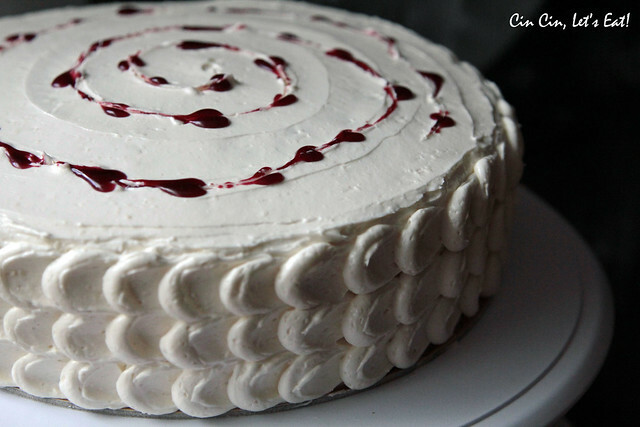 If you have 4 layers of cake to work with, you can fill the third layer with more blackberry preserve or a thin layer (1/2 cup) of the buttercream. Add the final layer of cake on top, smooth side up. 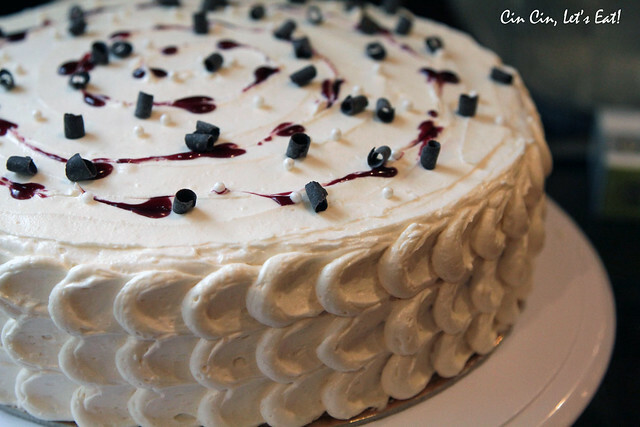 If you don’t need any intricate decoration on the cake, simple ice the top and the sides of the cake and voila. 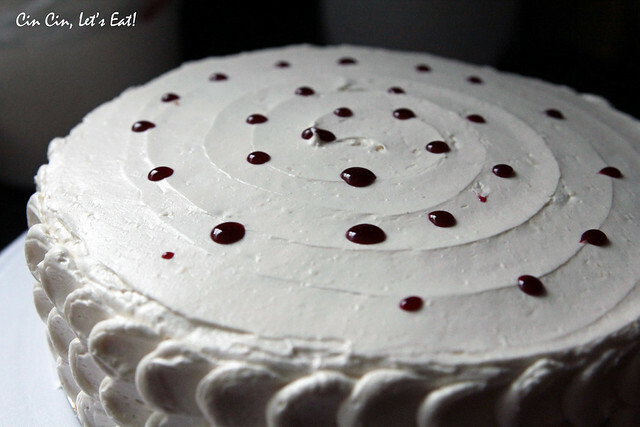 If you want to try the decoration I did, use 1 cup of the buttercream to ice the top and sides. Focus more on the top as the sides will be covered up with the pattern. What I ended up with was a nice smooth iced top while the sides looked more like a thin crumb coat. Fill a medium size piping bag (with a round piping tip, I used a Wilton 12) with the remaining buttercream. 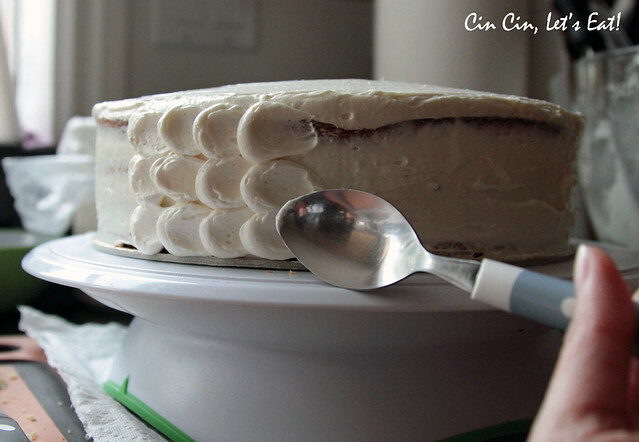 Pipe 3 1″ rounds vertically, and use the back of the spoon to gently press and smear the buttercream to the right. 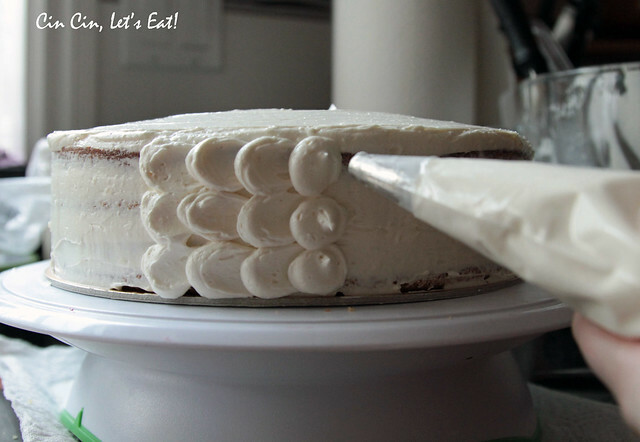 Repeat the same process until you have piped, spread, and covered the whole cake. 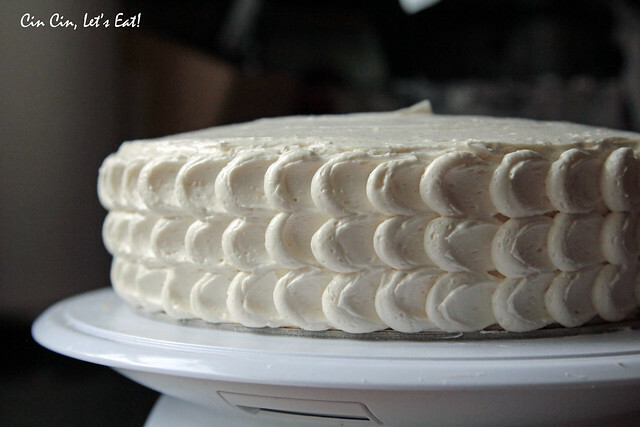 Keep cake refrigerated, but let it come to room temperature before serving. Heated up the remaining blackberry jam, dotted the top of the cake with them, and used a tooth pick to draw a line through them to make hearts. Topped the cake with chocolate curls and sugar pearls. This looks spectacular! I love the design, and it looks delicious! Such a beautiful cake!! I’m excited to see what goodies you plant in your garden! Superbly decorated! You have quite the talent!